Dear readers, I have a confession to make. I have, for some time now, developed something of a fondness for a genre of books I call Teen Dystopia (possibly other people call it that too). I’m not proud, but there it is. Hunger Games, Divergent, you name it and I lap it up. It’s not that I think it is always the best-written stuff, nor that the plots twist in ways that you can’t entirely predict from the start, and they certainly lack any sort of adult moral ambiguity, but there is something about young people struggling against an evil government machine and trying to do what is right that is endlessly heart-warming. Once We Were is the second in a trilogy. They are set in a future/alternate version of America, and the premise is that everyone is born with two souls in their body. Two personalities that for the first sevenish years share the body, until eventually one soul fades away. People whose souls don’t fade, and who retain two personalities, are known as hybrids and viewed as dangerous criminals. I’m about to summarize the first book, so if you don’t like spoilers, skip the next two paragraphs. The first book opens with Addie and Eva having reached teenagehood without people noticing that Eva is still there and hasn’t faded away. Eva is the recessive soul though so she doesn’t control the body and can only speak to Addie. Somehow though another girl and boy at her school, who it turns out are also hybrids, work it out and say that they can help Eva to grow strong and take control of the body sometimes too. Anyway, to cut a long story short, all three of them get caught and taken to a medical institution where they are testing a new method of ripping one soul out of the body. Just before this happens to them, they escape and are taken in by an underground group of hybrids. This second book starts with them all in hiding and trying to work out what they will do now that they are free. For me, this book lacked some of the pace of the first book. It seemed very focused on issues like “how can I kiss that hot guy when I’ve got another mind in my head who doesn’t want to”. I suppose in a teen dystopia that isn’t an unreasonable obsession, but I found it a bit yawnsome. The plot develops with Eva and Addie being drawn into a hybrid plot to blow up an institution, which is so clearly a bad idea from the start that when it goes wrong, it is no great surprise. And the book ends with them in not much of a different position to where they started. After finishing the first book I really wanted to read the second, but having in read the second I’m in less of a rush for the third to come out. If you like a teen dystopia though, the first book is worth a read. 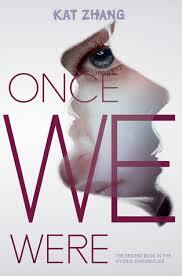 Tags: book review, books, Kat Zhang, Once We Were, reading, teen dystopia. Bookmark the permalink. Evenings, weekends, before bed, on the way to work, one the tube, on the bus. It is actually lovely always having a book to hand. I’m really enjoying it. I had forgotten how much I love reading. As for Star Trek… I believe I made my views and reasons clear in the first review. Sounds like a contender for the Oxfam box!